Leopoldskron Palace, Nonnberg Abbey, the Mirabell Gardens, the gazebo in Hellbrunn Garden, the church in Mondsee where the wedding took place: fans of the movie can take part in the Original Sound of Music Tour® and visit all of these filming locations in one day… perfect preparation for the Life Ball 2018. Sing Maria’s famous “Do-Re-Mi” song once you get to the Pegasus Fountain in Salzburg’s Mirabell Gardens, featured in one of the “Sound of Music’s” original scenes. Take a photo in the very same gazebo in Hellbrunn Garden where Maria and Baron von Trapp kissed. Reverently enter the church in Mondsee where the two exchange marriage vows. 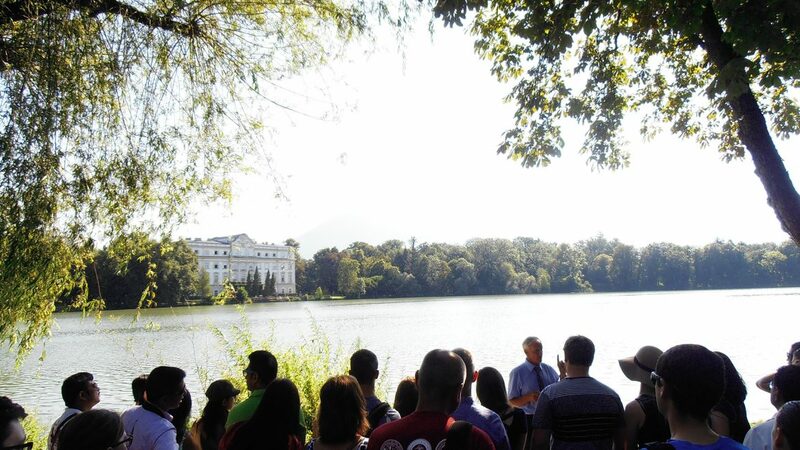 The wishes of all “Sound of Music” fans come true when they are able to do all these things in just one day on the Original Sound of Music Tour organised by Salzburg Panorama Tours. The “Original Sound of Music Tour” is led by live guides who are experts in the field. Whilst travelling to and stopping off at the filming locations in and around Salzburg, they divulge fascinating background information about the “Sound of Music” film, anecdotes from the actors’ days on the film set and and interesting facts about the von Trapp family. Follow in the footsteps of the multi-Oscar winning film and experience the legend at first hand! It goes without saying that Salzburg’s Mirabell Gardens are a permanent feature of the tour, alongside Hohensalzburg Fortress, which is another highlight of Salzburg’s historic Old Town. It’s here that Maria sings the famous “Do-Re-Mi” song with her Trapp protégés at the Pegasus Fountain and on the steps leading directly to the Mirabell Gardens. 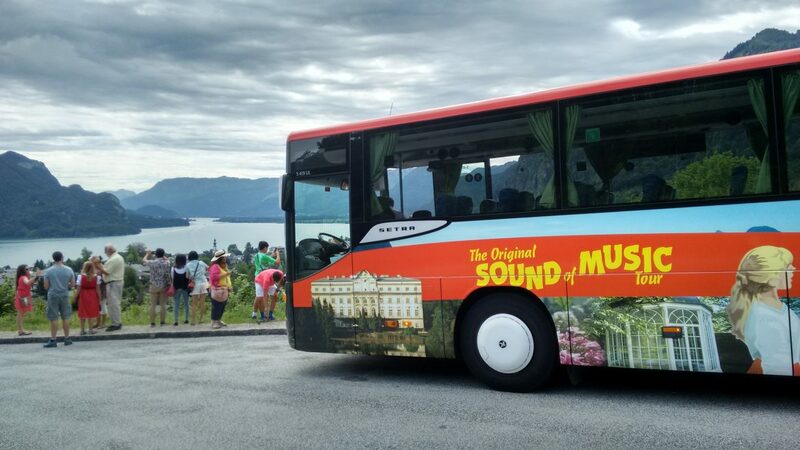 Then it’s off on the Original Sound of Music Tour Bus, from which tour participants can take a look at Nonnberg Abbey, to the idyllically placed Leopoldskron Palace. The lake on which the palace sits should be well known to all fans, as it’s where the famous boat scene took place. It’s then followed by one of the tour’s real highlights, a visit to the gazebo in the Hellbrunn Garden. The pavilion was renovated and made accessible especially for the “Sound of Music”. So, it’s absolutely perfect to take a photo, there where Maria and Baron von Trapp’s kiss scene once took place. In the Salzburg Lake District visitors can expect breath-taking views of the Fuschlsee and Wolfgangsee lakes, landmarks which repeatedly assume scenic lead roles in the “Sound of Music”. The grand finale is the church in Mondsee where Maria and Baron von Trapp got married, and you can use it as your base from which to explore Mondsee. The “Original Sound of Music Tour” is an absolute highlight for all “Sound of Music” fans upon visiting Salzburg and it’s absolutely not to be missed. What’s more, it’s perfect preparation for the Life Ball. Seeing the original movie locations in just one day is guaranteed to make all “Sound of Music” fans’ eyes light up.